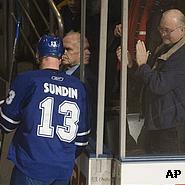 TORONTO (AP) -Mats Sundin's love for Toronto will last. His career with the Maple Leafs might soon be over, though. The Leafs' captain scored an early goal in what could have been his final game for Toronto, a 3-1 victory over the Atlanta Thrashers on Saturday night. 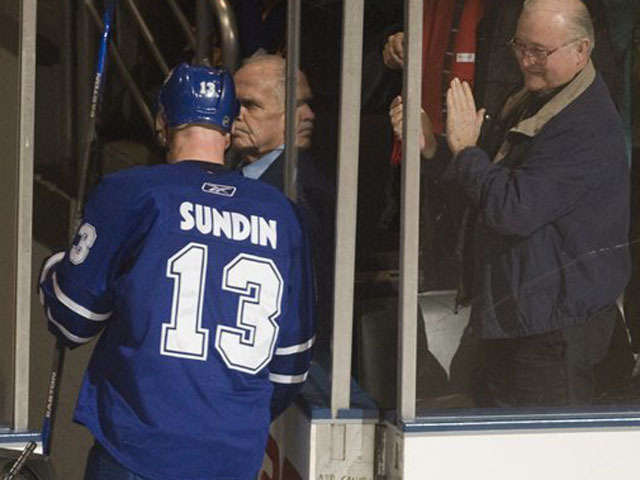 "No matter what happens I'll always love Toronto and I'm going to love the Toronto Maple Leafs," Sundin said. "It's been my home for the last 13 years and that's never going to change. "I hope people respect whatever decision's going to come out of this." Alex Steen and Nik Antropov had third-period goals in the Maple Leafs' last home game before Tuesday's trade deadline and Sundin is expected to meet agent J.P. Barry in Ottawa on Sunday to discuss the no-movement clause in his contract that interim GM Cliff Fletcher wants him to waive. Despite acknowledging that request, Sundin sounds content to finish the season in Toronto rather than accept a trade elsewhere. "I never believed in rental players to start with," he told reporters after Saturday's morning skate. "I think if you want to be part of the team that has a chance to win the Stanley Cup or a team that is going far in the playoffs, my opinion has always been that you want to be there from training camp or the start of the season to be part of the group." Mark Recchi scored for the Thrashers, who hurt their already marginal playoff chances. "If you can't beat one of the worst teams in the conference, we don't deserve it," Bobby Holik said. "There's no room for excuses. Those are facts. We all know that we lost to the Toronto Maple Leafs tonight, and what else is there to say? We weren't good enough to win. We weren't good enough in any aspect of the game." Sundin has been in Toronto since being acquired in a June 1994 trade. Steen's goal at 2:53 of the third period stood up as the winner. One day after signing a two-year contract extension, he raced in on the wing and backhanded a shot over Kari Lehtonen's left shoulder to make it 2-1. Antropov scored an insurance goal at 12:44. "Whatever he does he's well-supported by the guys in here," said Steen. "We want him to stay. "But he has done so much for this organization and this city for so long. It's a choice that he has to make." Recchi opened the scoring for Atlanta at 11:54 of the first period during a power play. He was standing alone at the side of the goal and banged in a rebound off a Marian Hossa shot for his 12th goal of the season. Sundin tied it 1-1 at 3:53 of the second period after a nifty play by Kyle Wellwood. The Leafs winger passed the puck from the high slot and the captain one-timed it by Lehtonen for his 25th of the season - and perhaps the final of his career in blue and white. Notes: In 970 career games with the Maple Leafs, Sundin has 413 goals, 558 assists and 971 points ... Toronto finished the season series with a record of 3-0-1 against the Thrashers ... Recchi has 28 points (10-18) in 34 games since being picked up on waivers by Atlanta earlier this season ... Antropov's goal was the 100th of his career ... Vesa Toskala started for the 19th time in the past 20 games.